Below are common attributes associated to Texas Ranger, Cenizo, Texas Silverleaf, Purple Sage, Wild Lilac, Ash-Bush. Become a care taker for Texas Ranger, Cenizo, Texas Silverleaf, Purple Sage, Wild Lilac, Ash-Bush! Below are member comments regarding how to plant Texas Ranger, Cenizo, Texas Silverleaf, Purple Sage, Wild Lilac, Ash-Bush. No comments have been posted regarding how to plant Texas Ranger, Cenizo, Texas Silverleaf, Purple Sage, Wild Lilac, Ash-Bush. Be the first! Do you know how to plant Texas Ranger, Cenizo, Texas Silverleaf, Purple Sage, Wild Lilac, Ash-Bush? 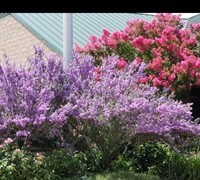 Below are member comments regarding how to prune Texas Ranger, Cenizo, Texas Silverleaf, Purple Sage, Wild Lilac, Ash-Bush. No comments have been posted regarding how to prune Texas Ranger, Cenizo, Texas Silverleaf, Purple Sage, Wild Lilac, Ash-Bush. Be the first! Do you know how to prune Texas Ranger, Cenizo, Texas Silverleaf, Purple Sage, Wild Lilac, Ash-Bush? Below are member comments regarding how to fertilize Texas Ranger, Cenizo, Texas Silverleaf, Purple Sage, Wild Lilac, Ash-Bush. No comments have been posted regarding how to fertilize Texas Ranger, Cenizo, Texas Silverleaf, Purple Sage, Wild Lilac, Ash-Bush. Be the first! Do you know how to fertlize and water Texas Ranger, Cenizo, Texas Silverleaf, Purple Sage, Wild Lilac, Ash-Bush? Below are member comments regarding how to deal with Texas Ranger, Cenizo, Texas Silverleaf, Purple Sage, Wild Lilac, Ash-Bush's pests and problems. No comments have been posted regarding how to deal with Texas Ranger, Cenizo, Texas Silverleaf, Purple Sage, Wild Lilac, Ash-Bush's pests and problems. Be the first! Do you know how to deal with pests and problems with Texas Ranger, Cenizo, Texas Silverleaf, Purple Sage, Wild Lilac, Ash-Bush? Looking for Texas Ranger, Cenizo, Texas Silverleaf, Purple Sage, Wild Lilac, Ash-Bush?